While I have addressed pricing and other money matters here before, it’s been awhile and the confounding mystery of it continues. Honestly, I still have an agonizing time determining retail prices for anything I make, but I do have a helpful way in. So when I was asked to present some pricing ideas and practices at a workshop for the current crop of local Open Studios artists, I decided to describe the considerations looming below the surface of the topic in addition to the how-to methods we generally seek above. Work hard to separate your pride (or your unvoiced shame) about your work from your pricing. It’s not a “once and done” effort. No single axiom/approach works every time or over time. Confidence in pricing requires research, soul-search, preparation, experimentation and experience. What motivates you? Personal expression? Recognition? Money? If Money is the strongest motivator, you’ll be fine. If not, keep reading. What’s your level of satisfaction in your career and current style? Tentative? Changing? Loud and proud? Giddy? Are you able to see your work objectively? If not, how can you create some professional distance? Ask whatever you like, but what does it sell for? Do you price the pieces you personally like higher? Should you? Describe your ideal collector in detail. You might already know them. How is this person like you? Whatever story and meaning you carry for your pieces, others won’t see them like that and will apply their own rationales and interpretations. Folks, even sophisticated well-heeled art lovers, buy art impulsively: they recognize it and fall in love. Price is just one part of this buying experience. Where are they located? Do they have any particular cachet or limitations? Are they focused primarily on selling art or on eating and entertainment? How is your work displayed, labelled, interpreted and lighted? How do you or your representatives engage with visitors? Local or Global, it affects expectations and behaviors. Discretionary Money = Less available and more accounted-for funds. Impulsive Money = More available and less watched. Great if you like to parse hours and receipts. Maybe it’s useful if your materials are costlier or your methods time-consuming. As you become more efficient and/or find cheaper materials sources, what does it do to your prices? Try it for yourself; it’ll be eye-opening. In 2D you can size by square inches or by perimeter measurement and use a base cost multiplier. Does this method work for 3D media using cubic volume or weight? Should it? These methods can have scaling inconsistencies and other irrelevancies. You still have to determine your multiplier. Try it for yourself, some folks swear by this. Price new work on the low end. If it sells easily, be quick to raise your price a bit. Raise again if it keeps selling and so on. Find the price point at which the sales slow up noticeably and hold or back down slightly, your choice. This is “green feedback.” Stay curious because your actual marketplace is speaking. Try it yourself over and over. Use your entire body of work and assign a range of prices to ALL of it. Does it make sense? Do your price-points match the market for similar work? Why or why not? There is wiggle room for anomalies and one-offs, but price them after you understand the range you determine. Try it for yourself but beware, as it ventures well into perceived aesthetics, comparables and subjectivity. Sometimes you just “know” the prices that work for you and your perfect people, your venue and economy. And it’s probably based on personally internalizing your whole iceberg. You don’t “try” this, you just do it when you’re ready. Maybe now? It’s probably a good thing to develop a stance regarding all of them. What’s your practice/policy? Detached confidence and practice helps. 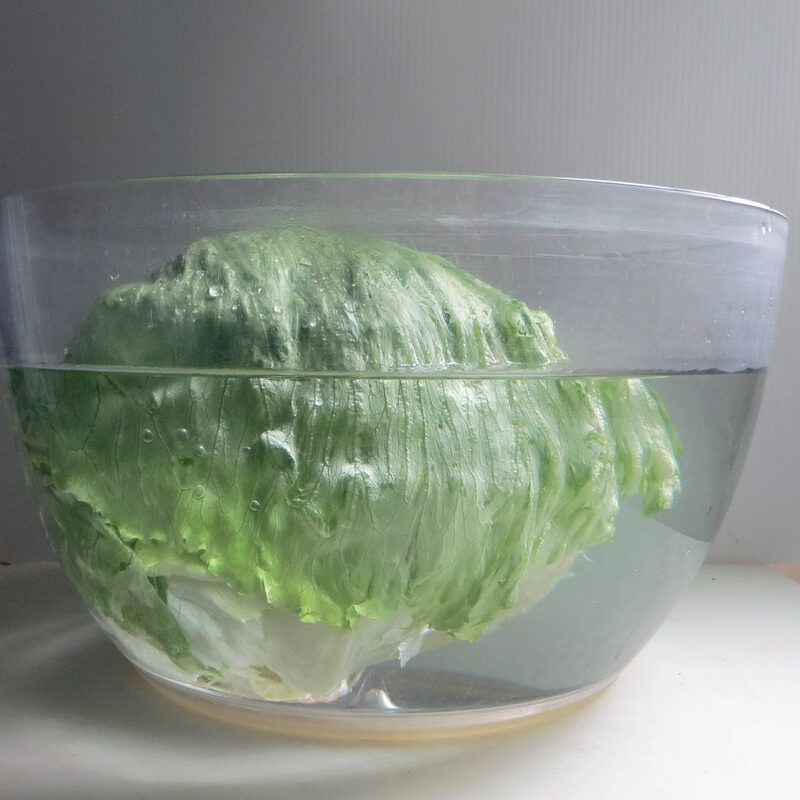 That’s why the head of iceberg lettuce is even more suited to the notion of pricing being a more-than-meets-the-eye thing: it’s organic, integrated leaf by enfolding leaf, revealing itself slowly. Pricing art is a nearly untranslatable alchemy anyhow because it requires an artist to range from suchness to materiality, aesthetics to a number. Good luck with forging your pathways, whether adapted here or yet to be discovered. –Liz Crain, who enjoys this observation of Oscar Wilde’s: “When bankers get together for dinner, they discuss art. When artists get together for dinner, they discuss money.” She’s been both a banker and an artist and says it’s true. Early on I was told to price my work expecting to be asked for a discount. And this does occur. Also I recently noticed at an Art Festival an artist posting a “gallery price” and below that a greatly discounted “festival price”. At the same event, an artist was offering an “artist’s” discount. Any thoughts on discounting? Liz, lots of great bullet points. Wow! I do believe you’ve written the Ten Commandments of pricing art. I need to print this out and re-read it every time I get ready to put a piece in a show, store, or gallery… thank you! Thank you Su. So much!!! This pricing thing has bothered me for all the same reasons it bothers everyone else. It’s one very obvious but ultimately very tangential part, but again, very pivotal, and again, very easy to mention, but again, NOT what our art is about. Bah! I also just did not trust the simple formulas because they didn’t work for me or anyone else I knew. Somewhere in there I realized the wholeness and layered aspects and I am so glad it resonates with you too.